The 2016 Science Walden Concert will be held at UNIST on this upcoming Thursday, March 31, 2016. This event, consisting of five consecutive lectures, features conversations between artists and scholars on themes related to art, science, and technology. 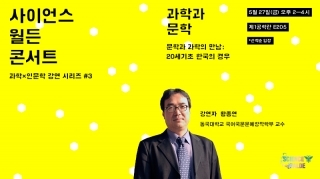 The 3rd lecturer of this year’s Science Walden Concert is Prof. Jong Hyun Hwang of Division of Korean Language & Literature and Literature and Creative Writing at Dongguk University.